The American Academy of Pediatrics recommends six months of exclusive breastfeeding (no formula or solid foods). Breast milk contains antibodies that support immune function as well as optimal nutrient ratios that change as the child grows. Until approximately 6 months of age, a baby’s digestive tract is not able to adequately digest most foods. Early introduction of foods may result in food allergies or sensitivities. Around six to nine months, breastfed and formula-fed infants will begin to develop their gastrointestinal track in a way that makes them ready to start some solid foods. Food introduction is one of the most important times in your child’s health; it becomes the building blocks and foundation of health for the rest of your child’s life. The gastrointestinal tract is an extension of the immune system. Introducing foods in a way that will not cause allergic reactions will help build a stronger and more solid foundation than if your child is always fighting off immune reactions. When should solid food introduction begin? 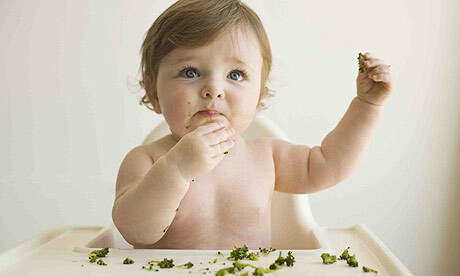 Most babies will become interested in food between six to nine months. Since breast milk is all your baby needs in terms of nutrients, there needn’t be any rush to start your baby on solids. Let your baby lead. If she is always grabbing for your food, then allow her to explore it. But if she isn’t interested, don’t force her to try it. If your child hasn’t started trying solids by nine months, start offering it to him and see how he responds. This transition to solids can be a source of stress for many parents. Take your time and be patient with your child. Know that she is getting all the nutrients she needs from your breast milk or formula. Up until the first year, the benefit to babies of trying solids is being exposed to new textures and learning hand mouth coordination; prior to a year most babies gastrointestinal tracts are not mature enough to be absorbing many nutrients from solids, so if your child isn’t eating a lot of solids, it is not compromising his nutrient intake as long as he is still drinking breast milk or formula. New foods should be introduced one at a time. Wait 3 to 5 days after introducing each new food to see if your baby reacts to the food. If your baby has any signs of reaction (see below), remove the food from baby’s diet for 2 to 3 months and then try again. If your child has a life-threatening reaction to food, such as trouble breathing, call 911. Your baby will show you when he has had enough to eat. Stop feeding him when he spits food out, closes his mouth or turns his head away. There is no reason to force a baby to eat a certain amount. Let him control how much he eats, even if it is only a bite or two! Many babies at first will only eat a bite or two once a day and sometimes not every day. It depends on the baby and their development. Enjoy this new time in your baby’s life as he explores new textures and tastes. Be playful with your child and let meal times be a fun game or a time to be social and sing songs about foods. Use it as a time to learn colors or numbers, instead of always focusing on getting your child to eat. If they don’t like something, introduce it again in a few months. Try to make it easier on yourself by modeling good nutrition to your child and giving them some of your meal, instead of always having to make something completely different for them. Enjoying our meals improves digestion and overall quality of life, so do what you need to for yourself to de-stress mealtime and enjoy. So many early health problems in children are related to food introduction. It is pertinent that you observe your child for signs of a reaction. If these early warning signs are not headed, more serious reactions may result as the immune system becomes more and more compromised. Use the following schedule as a general guide for introducing foods to healthy, full-term babies. If your child has chronic illness, special needs, or has signs of allergies or sensitivities such as asthma, chronic respiratory infections, or chronic ear infections, a modified schedule may be necessary.